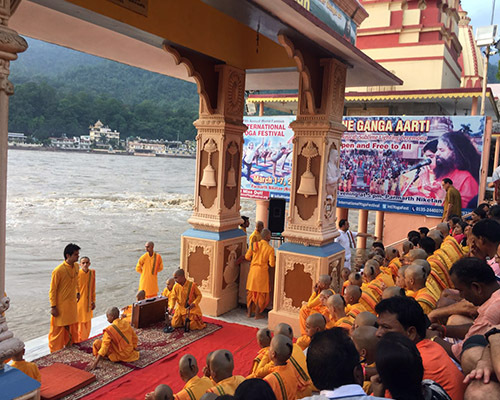 Our Advance Hatha Yoga Teacher Training course in Thailand is a combination of Hatha alignment theory, Advanced Hatha Yoga teaching techniques, Anatomy of Hatha Yoga, Hatha physical practice and the subtler introspective aspects such as Hatha philosophy, Pranayama, and meditation. We aim to combine these elements to create an Hatha Yoga Teacher Training in Thailand that is holistic in nature, practical and experiential. At Mahi Yoga, we provide Advanced Hatha Yoga Teacher Training Course in Thailand. Our carefully designed Advance Hatha Yoga courses in Thailand provide training in all aspects of the Hatha Yoga system. All our courses are certified by Yoga Alliance, USA. The real essence of advance hatha yoga teacher training Thailand to work on our mind, to make it balanced and to remove all kinds of stress as well as making the body fit through physical postures. Hatha yoga helps us to make our body and mind fit and also increases our energy levels. If you want to learn Hatha Yoga, there are many teacher training programs which focus on Hatha Yoga in Thailand. Our Hatha School offers advance hatha yoga instructor certification and hatha yoga course along with yoga and meditation, and Hatha yoga retreats in Thailand. We have a personalized segment for Hatha yoga teacher training Thailand and people from different corners of the world get enrolled in the professional training courses. We welcome the people interested to seek a career in Yoga getting established as a yoga teacher. Mahi Yoga Centre in Thailand courses are certified and holding the certificate of graduation in Yoga, the learners can start-up their career in Yoga as a trainer. With this certificate, the candidate will be welcomed by different yoga centers across different countries. This certificate determines that the person has distinguished knowledge about different yoga techniques and forms. Hatha yoga teacher training in Thailand opens up incredible opportunities of for a candidate. Who is the Advance Hatha Yoga Teacher Training Course Suitable for? Our Advance Hatha Yoga Teacher Training courses are aimed at future yoga teachers, and we focus highly on teaching methodology. Students will be analyzing each pose and every aspect of the Hatha Yoga system in detail. Then, by learning practical teaching methods, understand how to guide their own future students verbally, visually, through physical adjustment and careful observation. Having said this, we also recommend the Hatha Yoga Teacher Training in Thailand for dedicated practitioners who wish to deepen their Hatha Yoga practice as well as those who wish to teach. We believe that the process of teaching is the best way to learn. Both beginners and experienced yogis may join this course. There is a lot of knowledge to be gained here and our Teachers explain every part of the Hatha Yoga system in detail with modification of poses. However we do advise that any applicant is physically fit enough for the four hours per day of yoga practice and has had a yoga practice for at least 6 months prior to starting the course. Each application is considered on an individual basis. So, if you are unsure please don’t hesitate to contact us. Why Should You Choose the Advance Hatha Yoga Teacher Training Course? You can expect to experience many positive changes as out students often have life changing moments on our courses. This Hatha Yoga Teacher Training course offers a full and deep grounding in Hatha yoga. Our Advance Hatha Yoga certified teachers are all very knowledgeable and are incredible teachers. We pride ourselves on both our course content and teaching delivery. Hatha Yoga teacher training in Thailand are at the very essence of yoga’s roots, surrounded by nature and Yoga culture. Our accommodation is high standard, as well as our yogic vegetarian food menu. What will you get from the Advanced Hatha Yoga Teacher Training Course? On successful completion of the Advance Hatha Yoga Teacher Training Thailand, students will have a thorough grounding in the Hatha system. Students will leave confident in their own practice as well as understand how to instruct the Primary series of Hatha Yoga. Students often comment on feeling stronger, both mentally and physically as well as confident to go out and teach. 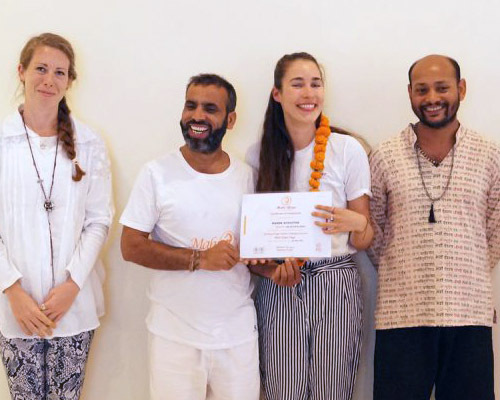 On successful completion of the Hatha Yoga Teacher Training Course in Thailand, students will receive a Hatha Yoga Certificate from Mahi Yoga. This course is registered with the Government of India as well as Yoga alliance USA. This certification is valid world wide. So, students are able to register with the appropriate Yoga association in their country of choice, such as Yoga alliance. How is the Hatha Yoga Teacher Training Course structured? We cover hatha yoga training in 24 days of intensive courses. Each day begins at 7am and ends at 7pm Monday to Friday with half-day on Saturdays. Sundays are free.